View More In Measuring Tools & Scales. Order Now and Enjoy the Convenience of Our 2-Year Warranty! 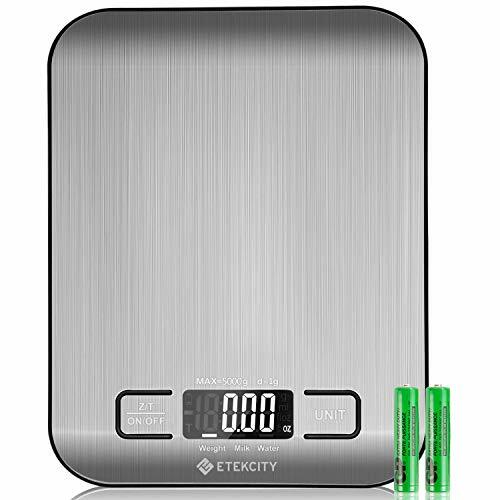 This Etekcity digital scale has endless uses for personal or commercial environments - great for homes, kitchens, offices, and more. The scale has an easy-to-read LCD display with beautiful clear backlit. With a capacity of 11lb (5kg), you can weigh a variety of items with ease. You will be surprised at all the uses you will have for this product. You can easily choose among measurement in oz, lb:oz, g, ml (Milk & Water). This digital scale measures in precise increments of 0.04oz (1 g) to accurately weigh your items. Power is provided by 2 AAA batteries (included), making the scale portable and ensuring that you can easily acquire replacement batteries. The tare function allows the user to deduct the weight of a container from the total weight in order to determine the net weight of the contents excluding the weight of the container which holds them.